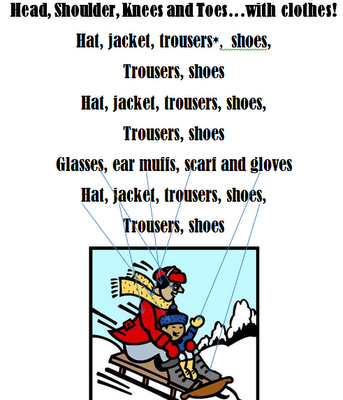 mELTing Activities, Lessons and Ideas: Head, Shoulders Knees and Toes...with Clothes! Head, Shoulders Knees and Toes...with Clothes! I prefer teaching trousers since pants has a different meaning in England, but to each their own. Feel free to teach pants, jeans, or whatever else. If you choose a one syllable word I reccommend adding an "and" to keep the beat.